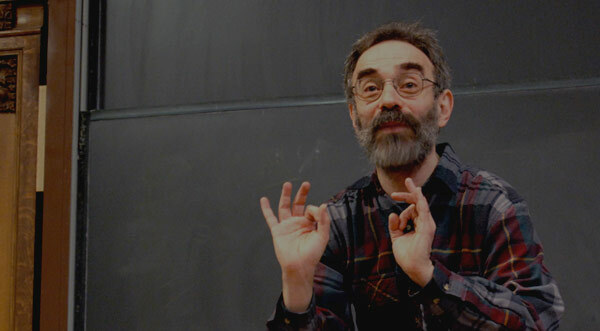 The lecture focuses exclusively on one argument for the immortality of the soul from Plato’s Phaedo, namely, “the argument from simplicity.” Plato suggests that in order for something to be destroyed, it must have parts, that is, it must be possible to “take it apart.” Arguing that the soul is simple, that it does not have parts, Plato believes that it would logically follow that the soul is indestructible. Professor Shelly Kagan: We’ve been looking at Plato’s arguments for the immortality of the soul, and so far I have to say I haven’t found them very compelling arguments. In a minute, I’m going to turn to an argument that at least strikes me as more interesting. It’s more difficult to pin down where it goes wrong. But before we do, I want to make a last couple of comments about the argument we were considering at the end of last class. It could be that what goes on is, when we bump up against something that’s partially just or partially beautiful or partially round — imperfectly round — what happens is, those things sort of trigger our minds in such a way that we begin to think about the forms for the very first time. So it might be, in order to think about justice and roundness, we have to grasp the forms. But it could be that we only grasp the forms in this life, for the very first time. Exposure to the things that participate in the forms may nudge our minds or our souls in such a way that at that point — given that exposure — we begin to grasp the forms. It’s as though the ordinary earthly objects, we bump into them or they bump into us, and they get us to look upwards to the heavenly Platonic realm. I don’t mean literally upwards. It’s not as though these things — the number three — is up there. But if you accept the metaphor, running into things in the empirical world gets our minds to start thinking about, for the first time, the heavenly realm of the Platonic forms and ideas. Now, the objection I’ve just raised is not an objection that Plato raises in the Phaedo, but he does raise a different objection. Remember our concern isn’t, strictly speaking, with the question, “Did the soul exist before our birth? Did the soul exist before our bodies?” but rather, “Is the soul immortal?” And so, having now given the argument from recollection, Plato envisions two of Socrates’ disciples, Simmias and Cebes, responding, objecting, by saying, “Look, even if the soul existed before birth, it doesn’t follow that it exists after death. And that’s, after all, what we really want, are wondering about. We want to know, will we survive our deaths? Is the soul immortal? And you haven’t yet shown that Socrates,” they object. Could be that it existed before, but won’t exist afterwards. But very nicely — it’s quite elegant structure at this point — Socrates puts together the two arguments that we’ve just been rehearsing — the argument from recollection and the argument that came before that, the one that I dubbed “the argument from recycling.” Remember, the argument from recycling says, when you build something, you build it out of parts, and when that thing falls apart you go back to the parts. All right. So the prior parts get recycled. The soul, we now say — based on the argument from recollection — the soul is one of our prior parts. The soul existed before we were put together, or before we were put together with our bodies. If you then combine the argument from recycling and say, the parts that existed before are going to exist afterwards, it must follow that if the soul existed before, it will exist afterwards as well. And so we’ve got the immortality of the soul after all. Now, bracket the fact that, as I just explained, I don’t myself find the argument from recollection persuasive. I don’t think we’ve got any good reason to believe — based on the sort of things that Plato is drawing our attention to — I don’t think we’ve got any good reason to believe that the soul existed before we were born. But even if we grant him that, we shouldn’t be so quick to conclude, on the basis of combining the argument from recollection and the argument from recycling, that the soul will continue to exist after the death of our bodies. After all, take a more familiar, humdrum example. Cars are built out of non-cars, right? Cars get built out of engines and tires and steering wheels. And the engine is not a car; the steering wheel is not a car. So you build the car out of its parts. Now, the engine is a prior-existing part. So can we conclude then that from the fact that — argument from recycling: parts get reused, get rebuilt, when cars get destroyed, the parts are still around — can we conclude from the argument from recycling and the fact that the engine is a prior-existing part from which the car was built, that the engine will continue to exist forever after the destruction of the car? No, obviously you can’t conclude that at all. Sometimes when cars get destroyed the engine gets destroyed right along with it. And of course, even if — in many cases — the engine continues to exist for a while after the destruction of the car, it certainly doesn’t follow that the engine is immortal, that it continues to exist forever. Engines will eventually decompose and turn back into atoms. So from the mere fact that the engine was a part that existed before the car existed, and the further fact that when the car breaks down, it decomposes back into parts, it certainly doesn’t follow that all of the parts that existed prior to the existence of the car will be around forever. That would just be false. So even if we were to give Socrates the assumption that — the thesis that — the soul existed before we were put together, before we were born, it still wouldn’t follow that the soul will continue to exist after we’re taken back apart. The soul might eventually decay just like the engine will eventually decay. What we need, to really become convinced of the immortality of the soul, is not the mere suggestion, even it was — even if we were convinced — is not the mere suggestion that the soul was around before our birth. We need to believe that the soul, unlike an engine, can’t itself be destroyed, can’t itself decompose, can’t fall apart. That’s what we need if we’re really going to become convinced of the immortality of the soul. Now, as I remarked previously, one of the amazing things — not amazing but one of the really attractive things about Plato’s dialogues is, you raise an objection and it often seems as though Plato himself, whether or not he explicitly states the objection, seems aware of the objection, because he’ll go on to say something that is responsive to it. And again, that makes sense if you think of these dialogues as a kind of pedagogical tool to help you get better at philosophizing. So the very next argument that Plato turns to can be viewed, I think, as responding to this unstated objection — well, I stated it, but Plato doesn’t state it in the dialogue — the worry that even if the soul was one of the parts, even if the soul was already around before we were born, how do we know it can’t come apart? How do we know the soul can’t be destroyed? Since what we want to know is whether the soul is immortal, how do we know it can’t break? Plato’s next argument then tries to deal directly with this worry, and it’s a quite interesting argument. I’ll give it another — a new label — I’ll call it the “argument from simplicity.” Socrates turns to a discussion of what kinds of things can break and what kinds of things can’t break; what kinds of things can be destroyed, and what kinds of things can’t be destroyed. He thinks about examples; he surveys examples and tries to extract a kind of metaphysical principle from this. And then, as we’ll see, he’s going to use this principle to convince us — or to try to convince us — that the soul is immortal, it’s indestructible. Well, lots of things can be destroyed. Here’s a piece of paper. It can be destroyed [sound of ripping paper] Right? Why was it that this was the sort of thing that could be destroyed? Well, the straightforward answer is the piece of paper had parts. And in breaking it, in ripping it, what I literally did was I ripped one part from another. To destroy the piece of paper, I take its parts apart. Here’s piece of chalk. The piece of chalk can be broken. What am I doing? Taking its parts apart. The kinds of things that can be destroyed have parts. They are composite. They are composed of their parts. Bodies can be destroyed because you can take a sword to it and go sweep, sweep, sweep and chop it into pieces. Composite things can be destroyed. Things that have parts can be destroyed. Now, what kind of things can’t be destroyed? Well, it won’t surprise you that when Plato looks for an example of something that’s eternal and indestructible, his mind immediately starts thinking about the Platonic forms. Take the number three. The number three can’t be destroyed, right? Even if nuclear explosion took place and everything on Earth got atomized and destroyed through some bizarre science fiction chain reaction, like they’re always doing in movies, the number three wouldn’t be touched. The number three wouldn’t be fazed. It would still be true that three plus one equals four. You can’t hurt the number three. You can’t alter or destroy perfect circularity. Why not? Well, it doesn’t have any parts. That’s the thought. Things like the Platonic forms are eternal, and they’re eternal, changeless, and indestructible, because they are simple — simple here being the metaphysical notion that they’re not composed of anything. Anything that’s built up out of parts you could, at least in principle, worry about the parts coming apart and, hence, the thing being destroyed. But anything that’s simple can’t be destroyed in that way. It has no parts to take apart. So the kinds of things that can be destroyed are the things with parts, and those are the sorts of things that change, right? Even if they’re not destroyed, what’s a tip off to something being composite? The fact that it changes. Suppose I take a bar of metal and I bend it. I haven’t destroyed it, but I’ve changed it. I’m able to change it by rearranging the relationships between the various parts. My body is constantly changing because the relationships between my arms and my head and so forth, my muscles are moving. You rearrange the parts, the thing changes. Oh, but that means it’s got parts and could be destroyed. So we’ve got some nice generalizations. Things that change have parts; things with parts can be destroyed. What are the kinds of things that you can change and destroy? Those are the familiar empirical objects that we can see: pieces of paper, bodies, pieces of chalk, bars of metal. In contrast, on the whole other side, you’ve got things that are invisible, like the number three — nobody sees the number three — things that are invisible, that never change. The number three never changes, right? The number three is an odd number. It’s not as though, oh, today it’s odd but maybe tomorrow it’ll be even. It’s eternally an odd number. Three plus one equals four today, yesterday and forever. These facts about the number three will never change. The number three is changeless. So the forms are eternal; they’re invisible; they are changeless. They’re simple, and simple things can’t be destroyed; forms can’t be destroyed. You put all this together; these are the sorts of thoughts that Socrates assembles, and I’ve got the initial thoughts up there on the board. [See Figure 8.1] All right. So premise number one, only composite things can be destroyed. Premise number two, only changing things are composite. So if you put one and two together, you’d get: only changing things could be destroyed. And now add three, invisible things don’t change. Well, if you’ve got to be the kind of thing that can change in order to be composite and you’ve got to be composite in order to be destroyed, invisible things don’t change, follows four, invisible things can’t be destroyed. That’s the metaphysical thesis that Socrates comes to by thinking about cases. And that’s the crucial premise or sub-conclusion for the immortality of the soul, because then Socrates invites us to think about the soul. Is the soul visible or invisible? He says, pretty obviously, “it’s invisible.” But if invisible things can’t be destroyed, the soul can’t be destroyed. So one, two and three got us four, invisible things can’t be destroyed, but five, the soul is invisible so six, the soul can’t be destroyed. That’s my best attempt at reconstructing the argument from simplicity. It’s not as though Plato himself spells it out with premises and conclusions like that, but I think this is fairly faithful to the kind of argument he means to put forward. Now, adding that qualification opens the door to a worry. The worry gets raised by Cebes who says, even if we grant that the soul is nearly indestructible, that’s not good enough to get us immortality. And he gives a very nice analogy of somebody who’s — a coat, which could outlast the owner but isn’t immortal. Or the owner could go through several coats; but still at some point the owner’s going to die as well. The owner is far more immortal, in that sense, closer to immortality. And I’ve gone through many coats in my life, but for all that, I’m not indestructible. If all we’ve got is the mere fact that the soul is “nearly” indestructible, it takes a whole lot more work to destroy it, maybe it lasts a whole lot longer; maybe it goes through a whole lot of bodies being reincarnated a half-dozen, or a dozen, or hundred times before it wears out and gets destroyed. That’s not enough to give us the immortality of the soul. That’s the objection that Cebes raises. And one of the oddities is that, as far as I can see, Socrates never responds to that objection. Raises the objection — that is, Plato raises the objection in the voice of Cebes — but Socrates, on Plato’s behalf, never answers the objection. It’s hard to say what exactly is going on. It might be that Plato’s worried that he hasn’t really shown that the soul is immortal afterwards. Maybe this argument from simplicity isn’t really as good as it needs to be. And maybe that explains why Plato then goes on to offer yet another argument. After all, if this argument really did show the immortality of the soul, why would he need to offer a further argument? — The argument from essential properties, which we’ll be turning to later. So maybe Plato just thought there wasn’t a good answer to Cebes’ objection. But I want to say, on Plato’s behalf, or at least on behalf of the argument, Socrates should never have concluded the argument with this odd qualifying phrase that the soul is “indestructible or nearly so.” He should’ve just said the soul is indestructible, full stop. After all, if we have premises one, two, and three — only composite things can be destroyed, only changing things are composite, invisible things don’t change — if you put those together, you get four, invisible things can’t be destroyed. You don’t get the more modest conclusion, “invisible things can’t be destroyed or it’s a whole lot harder to destroy them.” If we’ve got one, two and three, we’re entitled to the bold conclusion: “invisible things can’t be destroyed, period.” Full stop. And then if five is true, if the soul really is invisible, we’re entitled to conclude six, the soul can’t be destroyed — not, the soul can’t be destroyed, or if it can be destroyed it’s very, very hard and takes a very, very long time. We are, rather, entitled to the bolder conclusion, the soul can’t be destroyed, full stop, period, end of the discussion. So despite the fact that Socrates draws this weaker conclusion, it seems to me that the argument he’s offered us, if it works at all, entitles us to draw the bolder conclusion. Not that the soul is indestructible or nearly so, but that the soul is indestructible. Well, maybe Plato realized that; maybe that’s the reason why he doesn’t bother giving an answer to Cebes. Maybe it’s an invitation to the reader to recognize that there’s a better argument here than even the characters in the drama have noticed — don’t know, don’t know what Plato had in mind. But at any rate, our question shouldn’t be, “What was Plato thinking?” but, “Is the argument any good?” Do we now have an argument for the immortality of the soul? After all, if the soul can’t be destroyed, it’s immortal. Is it a good argument or not? Simmias raises a different objection. Simmias says we can’t conclude that the soul is indestructible, or nearly so, or whatever, because we should not believe the sub-conclusion four, invisible things can’t be destroyed. Simmias says invisible things can be destroyed. And if that’s true, then of course we no longer have an argument for the indestructibility or near indestructibility of the soul. Because even if the soul is invisible, five, if nonetheless, contrary to what Socrates was claiming, invisible things can be destroyed, then maybe the invisible soul can be destroyed as well. Now, Simmias doesn’t merely assert, boldly, invisible things can be destroyed. He offers an example of an invisible thing that can be destroyed — harmony. He starts talking about the harmony that gets produced by a stringed instrument; let’s say a harp. In fact, he says, this is a very nice example for us to think about because some people have suggested — Simmias says — some people have suggested that the mind is like harmony. It’s as though the mind is like harmony of the body. So to spell out the analogy a bit more fully, and I’ll say a bit more about it later, harmony is to the harp as the mind is to the body. All right. He says, there are people who put forward views like this, and at any rate harmony can certainly be destroyed. You don’t see harmony, right? Harmony is invisible. But for all that, you can destroy harmony. So there’s the harp making its melodious, harmonious sounds, and then you take an ax to the harp, bang, bang, bang, chop, chop, chop, or a hammer or whatever; now the harmony’s been destroyed. So even though it’s invisible, you can destroy it by destroying the musical instrument on which it depends. And of course, there’s the worry, right? If the mind is like the harmony of the body, then maybe you could destroy the mind, the soul, by destroying the body on which the mind depends. So the crucial point right now is that thinking about harmony is offered as a counterexample to the generalization that invisible things can’t be destroyed. Harmony is invisible. Harmony can be destroyed. So invisible things can be destroyed. So you’re wrong, Socrates, when you say invisible things can’t be destroyed. So even if we grant that the soul is invisible as well, maybe the soul also is an invisible thing that can be destroyed. That’s a great objection. It’s an objection worth taking very seriously. And the oddity is, Socrates doesn’t respond to it in the way that he should have, in the way that he needed to. Socrates instead spends some time worrying about the question, “Is the soul really like harmony or not?” Is this metaphor — think about the relationship between the mind and body as similar to the relationship between harmony and a harp — Socrates spends some time criticizing that analogy. Now, in a few minutes I’ll turn to the question, what about Socrates’ criticisms of the analogy? Are they good criticisms or not? But even if they are good criticisms, I want to say, that’s not good enough to help your argument Socrates. Even if we were to say, you know what? The mind isn’t very much like harmony at all. That analogy really stinks. So what? All that Simmias needs to cause problems for Socrates’ argument is the claim that harmony is invisible and harmony can be destroyed. As long as that is true, we can’t continue to believe that invisible things can’t be destroyed. So what Socrates needs to do is to say either harmony can’t be destroyed, but pretty obviously it can, the melodious sounds coming out of an instrument can be destroyed. So he would need to argue then, perhaps, that harmony is not really invisible. If he could show us, if he could convince us, that harmony is not really invisible, then we would no longer have a counterexample to the claim that the invisible can’t be destroyed, and the argument could still then proceed as it was before. So that’s what Socrates should have done. He should have said, “You know what? Harmony is not really invisible,” or “It can’t be destroyed.” But there’s not a whiff of that, at least in the dialogue as we’ve got it, not a whiff of that as far as I can see. Socrates never says, “Simmias, here is where your objection goes wrong. Harmony is not really invisible, can’t really be destroyed, whatever it is. So we don’t really have a counterexample.” Instead, he gets hung up on this question, “Is it a good analogy? Is it a good way for thinking about the mind or not?” But even if it isn’t, that wouldn’t save the argument. Now, I am going to take some time to think about whether or not harmony is a good analogy, because I actually think it is a good analogy. I think what’s going on in the harmony — the suggestion that we should think about the mind like harmony, as though it was the harmony of the body — is an early attempt to state the physicalist view. Talk about the mind, says the physicalist, is just a way of talking about the body. Or, more carefully, it’s a way of talking about certain things the body can do when it’s functioning properly, when it’s well tuned, as we might put it. Just like, talk about the harmony or the melodious sounds or what have you of the harp, is a way — these things are a way of talking about what things the harp can do. It can produce melodious, harmonious sounds when it’s functioning properly, when it’s well tuned. So the harmony analogy is, I think, an attempt, and not a bad attempt, at gesturing towards the question, how do physicalists think about the mind? Now, when I tried to get you to grasp how physicalists think about the mind, I used examples about computers and robots and the like. Well, it’s not remotely surprising that Plato doesn’t use those kinds of analogies. He doesn’t have computers; he doesn’t have robots. Still, he has physical objects that can do things. And the ability to do things depends on the proper functioning of the physical object. And so, I think he can see that there’s this alternative to his dualism. He can see you could be a physicalist and say that the mind is dependent on the body; the mind is just a way of talking about what the body can do when it’s working properly. It’s dependent just the same way that, well, for example, harmony is dependent upon the physical instrument. So I think it’s a very nice attempt to discuss the physicalist alternative to Plato’s dualism. And that’s why it will be worth taking some time to ask ourselves, well, what about Plato’s objections then? If he can convince us that the soul is not like harmony of the body, maybe that will be some sort of problem for the physicalists. So I’ll come back to that in a few more minutes. But first, let’s worry about the point that I was emphasizing earlier, namely, even if the soul’s not very much like harmony, so what? If harmony really is invisible and harmony really can be destroyed, then invisible things can be destroyed. Even if the soul’s nothing like — that’s not a good analogy for thinking about the physicalist position or what have you — so what? If some invisible things can be destroyed and harmony is an example of that, then, by golly, it’s going to follow that we can’t conclude from the invisibility of the soul that the soul cannot be destroyed. So even though Socrates doesn’t respond to that objection, we need to ask on Socrates’ behalf, is there a possible answer to this objection? And I think there are at least the beginnings of one. We have to ask: when we say, “invisible things can’t be destroyed,” what did we mean by “invisible?” And I want to distinguish three different possible interpretations, three different claims. [See Figure 8.2] So invisible means, one, there’s one possibility, can’t be seen. Two, different possibility, can’t be observed. I’ve got in mind the broader notion of all five senses. Three, different possible interpretation of invisible, can’t be detected. What we have to ask ourselves is, when Socrates puts his argument forward, which of these did he have in mind? First, let’s be clear on how these things are different. Some things can’t be seen but can be sensed some other way. So colors can be seen; smells cannot be seen, but of course smells — the smell of coffee — can be sensed through the five senses. Sounds can’t be seen, they’re not visible, but for all that they can be sensed. You can hear them through your ears. So, without getting hung up on what does the English word “invisible” mean, let’s just notice that there’s a difference between saying “it can’t be seen through the eyes” and “can’t be observed through one sense or the other.” And then three is a different notion altogether, a stronger notion altogether. There might be things that can’t even be detected through any of the five senses. The number three — not only can’t I see it, I can’t taste it, I can’t hear it, I can’t smell it, can’t touch it, right? The number three is invisible in this much bolder way. It can’t be detected at all by the five senses — can’t be detected in terms of its — it doesn’t leave traces behind, right? I don’t see dinosaurs, but of course they leave traces behind in fossils. There’s a way in which you can talk about it being detected by its effects. All right. So again, don’t get hung up on what does the English word invisible mean. Let’s just ask ourselves, what notion of invisibility — if we’ll use the word between these three ways — what notion did Socrates’ argument turn on? Well, the most natural way to start by interpreting him is with number one. When he says, “Invisible things don’t change,” what he means is, things that you can’t see don’t change, and so — continue to interpret invisible in number four the same way — invisible things can’t be destroyed. On the first interpretation what he’d be saying is, “If you can’t see it with your eyes, it can’t be destroyed.” Now, the trouble is, harmony shows that that’s not so. Harmony is indeed invisible in sense number one. You cannot see it with your eyes. But for all that, it can be destroyed. So if what Socrates means by invisibility is the first notion, can’t been seen with your eyes, then the argument’s not any good. Harmony is a pretty compelling counterexample. But maybe that’s not what Socrates means by invisible. Maybe instead of one, he means two. When he talks about the soul being invisible and invisible things being indestructible, maybe he means things that can’t be observed through any of your five senses. Now, in point of fact, I think that is what he meant. Let me just give a quick quote. In our edition, this is page 29. Some of you may have noticed that there are little standardized paginations in our edition as well. So it’s in the academy paginations, number 79; he’s talking about the difference between the visible and the invisible things, chairs versus the forms. And he says, “These latter, chairs, trees, stones, you could touch and see and perceive with the other senses. But those that always remain the same, the forms, can only be grasped by the reasoning power of the mind. They are not seen but are invisible.” So I think it’s pretty clear that when Socrates starts talking about what’s visible versus invisible, he doesn’t mean to limit himself to vision; he means to be talking about all of the five senses. So when we say — when he says — “Invisible things can’t be destroyed,” he means the things that you can’t see or touch or hear or feel — whatever it is — see, touch, smell, taste. Those things can’t be destroyed. Now, notice that if that’s the way we interpret his argument, harmony no longer works as a counterexample. Harmony was invisible when we meant definition number one, can’t be seen. But it’s not invisible if we mean definition number two, can’t be sensed, can’t be observed. Harmony can be sensed through the ears, in which case it’s not a counterexample. It’s not a counterexample to four. Four says, “Invisible things can’t be destroyed.” And what Socrates should have said is, harmony is not invisible in the relevant sense of invisible, since it can be sensed. But — and this would be the crucial point — notice, Socrates should’ve continued, the soul is invisible in that sense. You don’t see the soul; you don’t taste the soul; you don’t touch the soul; you don’t hear the soul. So if we understand the argument in terms of the second interpretation of invisible, it looks as though the argument still goes through. Simmias’s counterexample fails. Harmony is not invisible in the relevant sense, so it could still be true that invisible things can’t be destroyed. Since the soul is invisible in that sense, it would follow that the soul can’t be destroyed. However, even if Simmias’s objection, his particular counterexample, harmony, fails, that doesn’t mean that we should still accept the argument because there might be a different counterexample. So here’s my proposal. Suppose we think not about harmony but radio waves. Radio waves are not sensible. They are not observable. You don’t see a radio wave. You can’t touch a radio wave; you can’t smell a radio wave, and interestingly enough, you can’t hear radio waves. But of course, for all that, they can be destroyed. So even if we grant that what Socrates meant by invisible was “cannot be observed,” we still have to say, with Simmias, “You know, four is just not true. Some invisible things can be destroyed.” Radio waves can be destroyed even though they’re invisible in the relevant sense. Yeah? Question? Professor Shelly Kagan: Okay. So the suggestion was, radio waves are a bit like the forms. Professor Shelly Kagan: They’re not forms, but they’re perfect in that way. Was that the thought? Professor Shelly Kagan: Ah! Okay, I misunderstood. So the question is rather, “Look, radio waves are not like forms,” to which the answer is “Yes, that’s exactly the problem.” They are invisible, like the forms, but unlike the forms they’re destructible. And that’s precisely why we’ve got to worry about the soul. Is the soul invisible in the way the forms are, being indestructible, or is it invisible in the way that radio waves are, destructible? Now again, my point here is not to say, “Oh, you idiot, Plato! Why didn’t you think of radio waves?” Our question is not, was Plato overlooking something he should’ve thought of? It’s, does his argument work or not? Is it true that the invisible things can’t be destroyed? And it seems to me that some things that are invisible in the relevant sense, radio waves being an example of that, can be destroyed. So even though the soul is also invisible in the relevant sense, maybe it can be destroyed as well. Now, the answer, it seems to me, the only answer I can imagine Socrates or Plato giving at this point, is to say, “Look, I need a different definition of invisible. Not two, but three. Don’t talk about what we can sense; talk about what we can detect.” Radio waves can be detected, right? After all, radios do that. You turn on your radio, the radio wave’s passing by, boom — properly tuned, you detect it. It turns it into these sounds that we can hear. We can detect radio waves on the basis of their effects on radios, among other things. So maybe by invisible he should’ve moved to this stronger, bolder definition of invisible. Let’s call something invisible not only if it can’t seen, not only if it can’t be observed, but if it can’t be detected at all. Look, the forms, after all, can’t be detected. There’s no radio for the number three that will tell — There’s no Geiger counter to tell you the number three is nearby or something, right? So Plato could still insist things that are invisible, in the sense of undetectable, can’t be destroyed. But radio waves, they’re detectable. So they’re not a counterexample, now that we interpret the relevant notion of invisibility as undetectability. So couldn’t Plato continue to claim, things that are fully invisible, meaning undetectable, those things can’t be destroyed. Radio waves aren’t a counterexample to that. I think maybe Plato could say that. But, if we give him four, where we read invisible as meaning utterly undetectable, it’s no longer so clear to me that we can give him five. Is the soul invisible? Well, it was, when by invisibility we meant can’t be seen; it was, when by invisibility we meant can’t be tasted or touched or heard or smelled. But is it still invisible if by invisibility we mean can’t be detected? Is it true that the soul can’t be detected? I’ve got to say, I think it’s no longer right. Once we interpret invisibility that way, the soul is detectable in just the way — not literally just the way, but in something similar to the way — that radio waves are detectable. If you hook a radio wave up with a radio, you can tell the radio is — radio wave — was there because of what the radio’s doing, giving off these sounds. If you hook a soul up to a body, you can tell the soul is there by what the body is doing, discussing philosophy with you. You detect the presence of your friend’s soul through its effects on your friend’s body. But that means the soul isn’t really undetectable. But if the soul’s not really undetectable, it’s not really invisible in the relevant sense. And if it’s not really invisible, then even if there is a notion of invisible, such that things that are invisible in that sense can’t be destroyed, the soul’s not invisible in that sense. I’ve gone over this argument at such length because — I hope it’s clear — I think it’s a pretty interesting argument. The argument from simplicity is quite fascinating. The idea that you couldn’t break the soul if it didn’t have parts, and the way to tell that it doesn’t have parts is because it’s invisible, because invisible things can’t have parts, that’s a quite difficult argument to pin down, does it work or does it not work. But I think, as we think it all through, we have to conclude it doesn’t work. Okay.